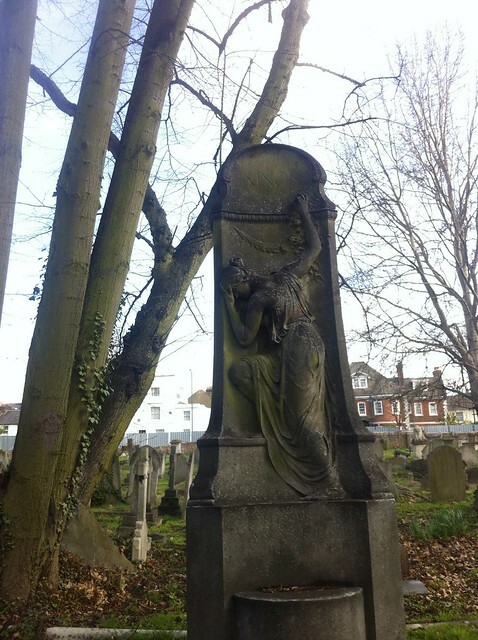 London Day 4: Kensal Green Cemetery | Allez, Allie! 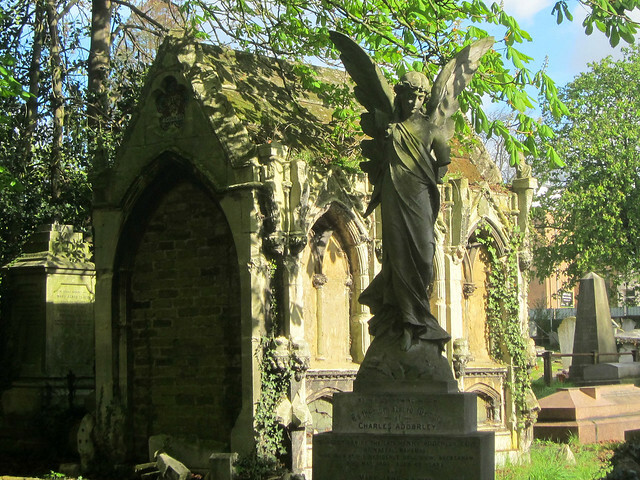 With my fourth day in London wide open to any plans I cared to make, I naturally decided I was going to visit as many of the Magnificent Seven Cemeteries as possible. 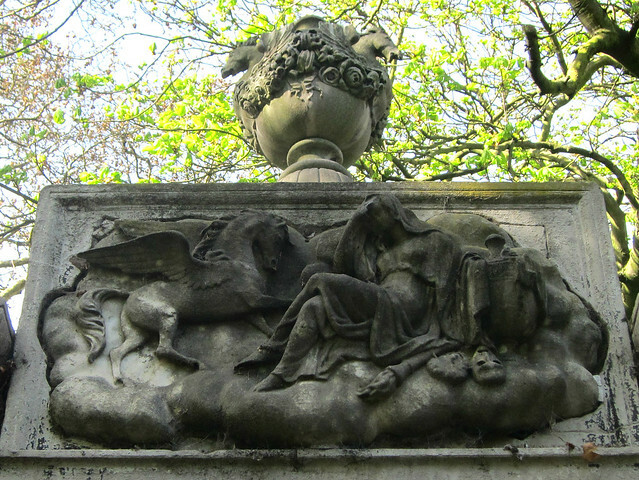 The term refers to seven garden-style cemeteries established in the 19th century in London to alleviate cemetery overcrowding, and all have some haunting Victorian imagery in their statuary. 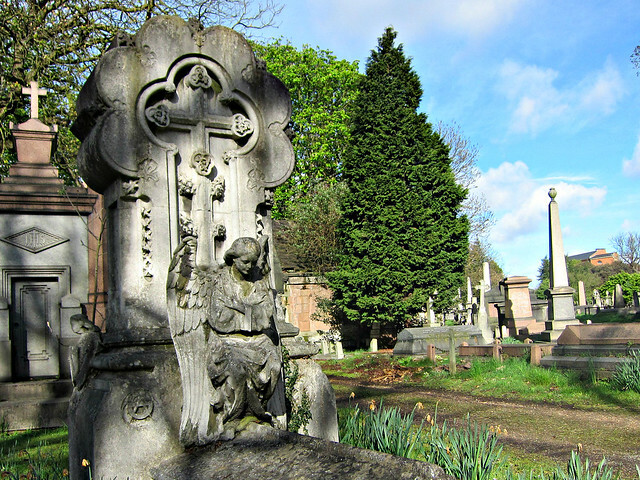 I started my morning in Kensal Green Cemetery, the oldest of the Magnificent Seven, and therefore the oldest public burial ground in London, having been established in 1832. 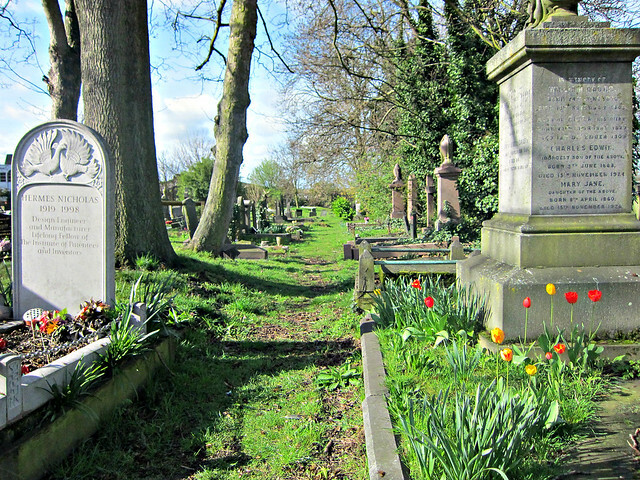 Overgrown with moss and with walking paths of soft earth, Kensal Green is definitely atmospheric, with a heavy air over its tranquil grounds. 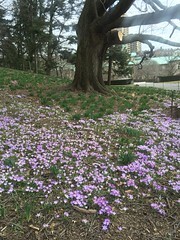 It is located in the Kensington and Chelsea borough in West London, a short walk from the Underground on Harrow Road. 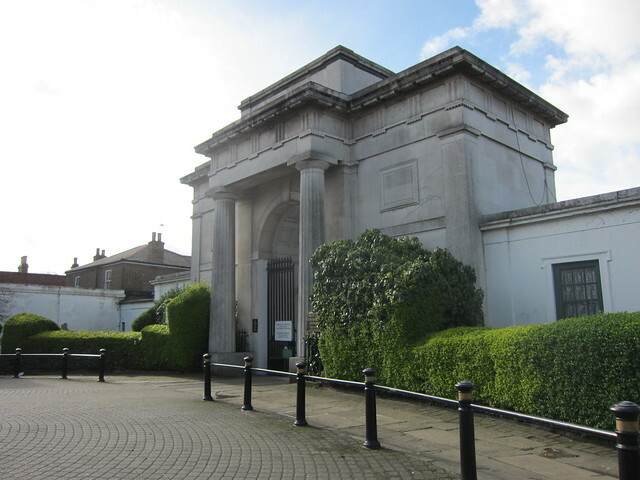 Above is its mausoleum-like entrance. The cemetery was once divided between members of the Church of England and “Dissenters,” aka people who had left that church to found their own, but the fences have now been reamoved, although there are still three separate chapels on the grounds. 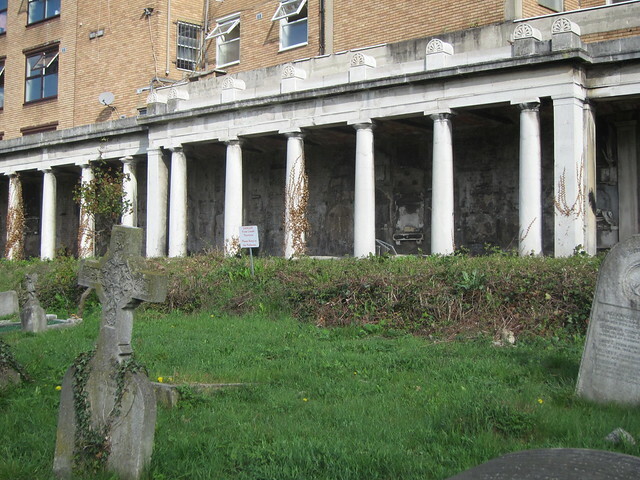 The most visible is the Anglican Chapel shown above, a Greek Revival structure that sits above an extensive catacomb serviced by a catafalque elevator for lowering down the coffins. 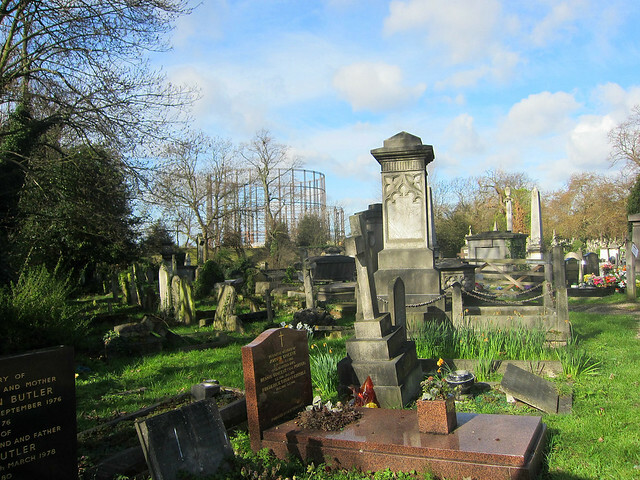 On one side of the cemetery is the Grand Union Canal; the circular metal things you can see in the background of the above photos are the gasometers that rise up on the other bank. Apparently coffins were once delivered via canal boats and you can still find the landings if you’re brave enough to walk that way. 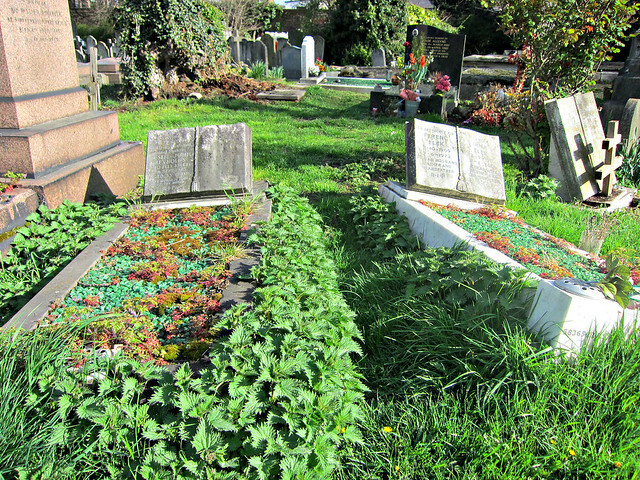 While it wasn’t completely in shambles, Kensal Green was in some state of neglect, and I saw tombs definitely toppled by time rather than vandalism, and vines claiming large territories. 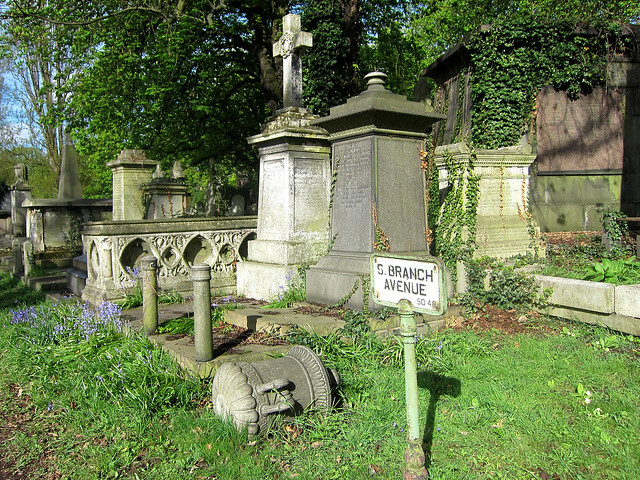 But it was a tidy sort of disorder, almost like I was on a creepy cemetery film set. Although worn down, or maybe because of that, there were plenty of beautiful examples of funerary sculpture. 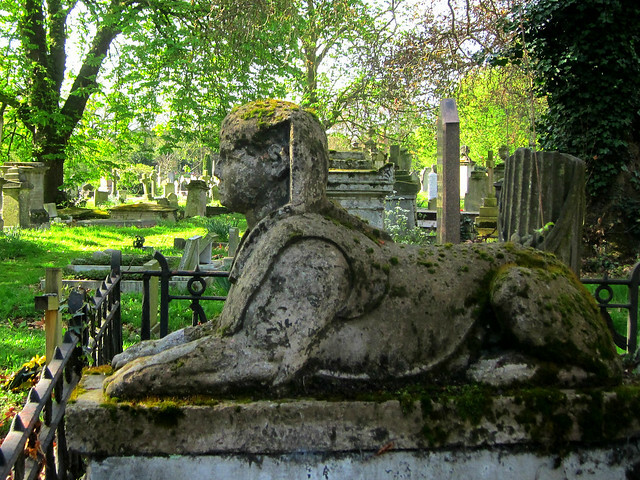 This sphinx was one of four guarding the grave of Andrew Ducrow, a circus performer who is considered the father of British circus equestrianism. 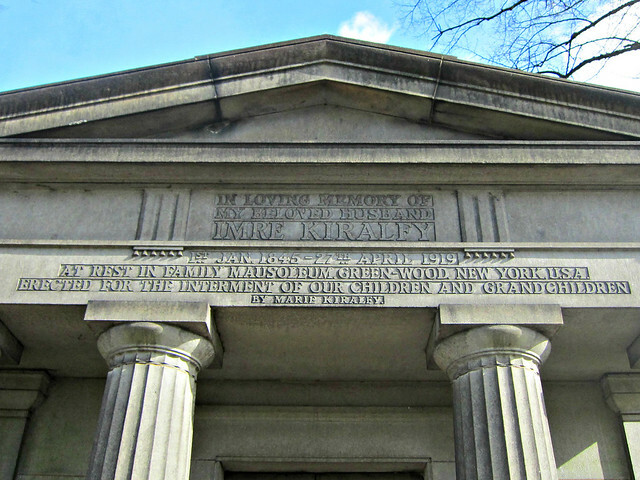 Originally his Egyptian-style mausoleum was painted in pastel colors, but these have faded away. 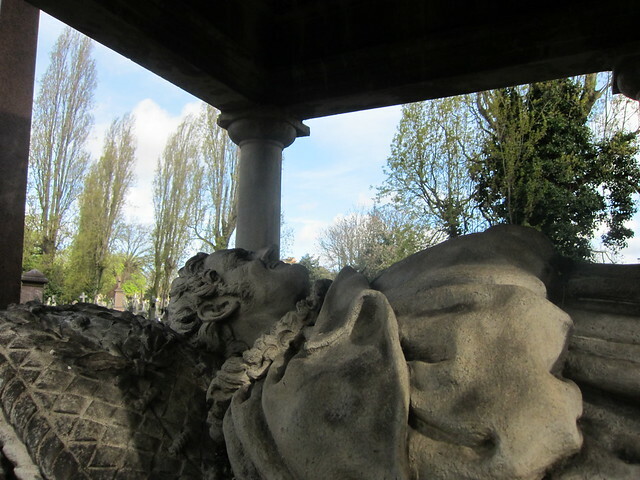 Here is one particular mausoleum that stopped me in my tracks. 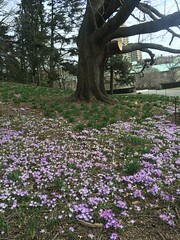 As you may know, I live quite close to Green-Wood Cemetery in Brooklyn and have explored it extensively and even give some tours there sometimes (I’ve leading one this Saturday!). If you read the above inscription, you’ll see: “In Loving Memory of My Beloved Husband Imre Kiralfy: 1st Jan. 1845-27th April 1919. At rest in family mausoleum, Green-Wood New York, USA. 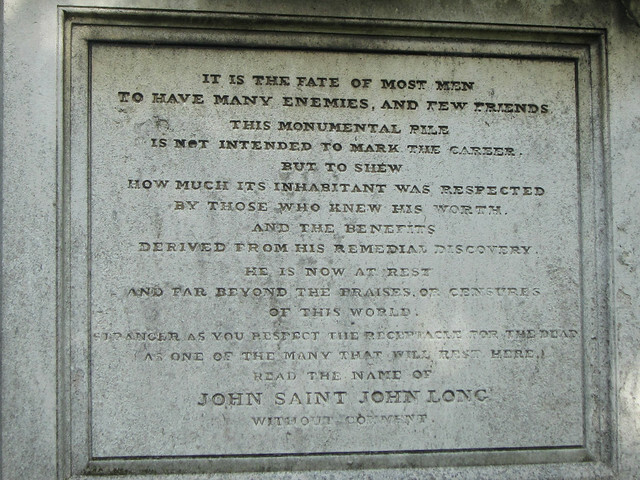 Erected for the Interment of our children and grandchildren by Marie Kiralfy.” Okay, so leaving aside that my birthdate is his death date (not the year of course), how very bizarre to stumble upon this inscription about a place I know so well when I am so far from home. Next time I’m in Green-Wood, I definitely have to track down the Kiralfy family mausoleum. I read that Kiralfy was a rather successful producer of stage spectacles, even working on one with Thomas Edison. 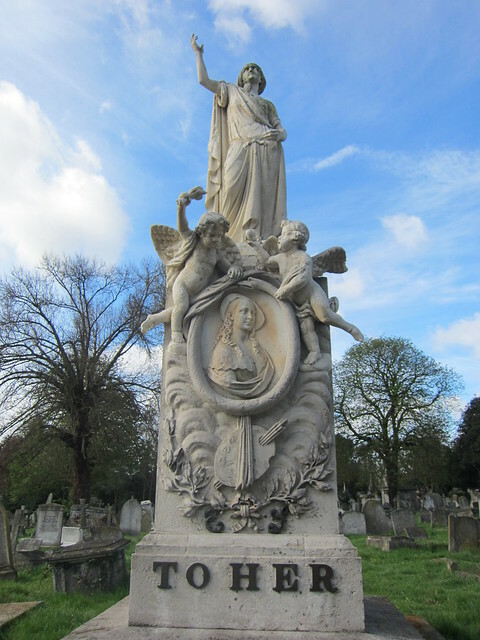 This being a Victorian cemetery celebrating the “beautiful death,” there were some beautiful lady mourners in stone, including angels with solemn expressions and this lovely weeping lady, with some incredible detail to the draping of her dress, even to the bend of her knee. 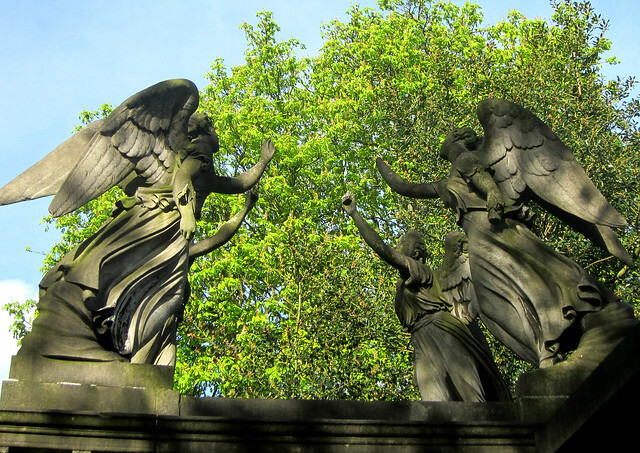 The bricked up mausoleum behind the angel is that of Sir Patrick O’Brien, an Irish politician. 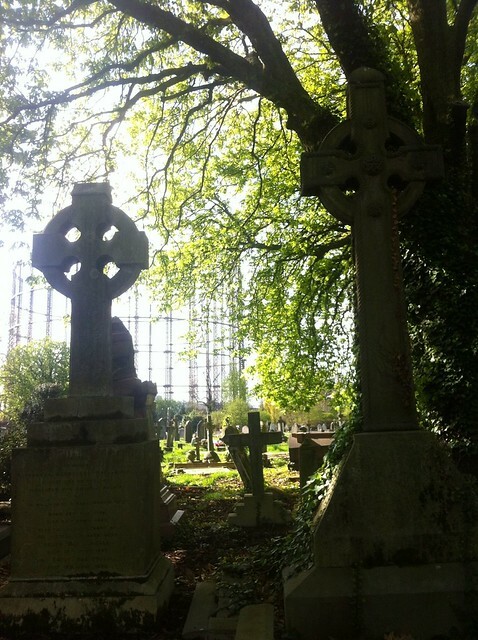 There are many notable burials in Kensal Green, but as I had arrived with no map and could not find one there, everything I saw was purely serendipitous. This is the grave of Alexis and Elizabeth Soyer. Alexis was a chef from France who fled to England during the Revolution of 1830, where he later met and married the portrait artist Elizabeth Emma Jones. 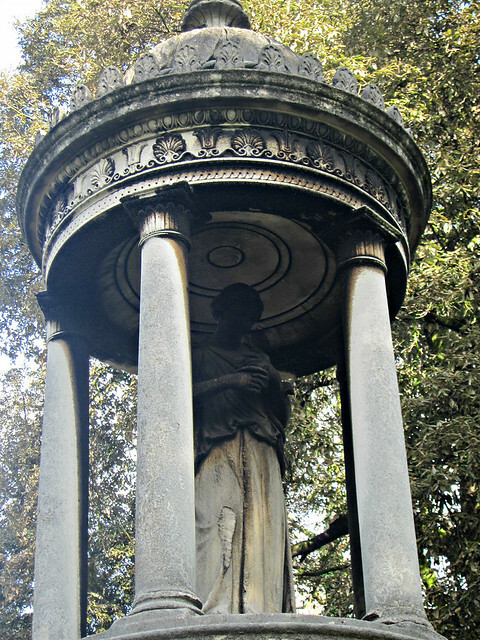 She died in 1842 during childbirth, and here she is memorialized in the ornate tomb they now share together, although Alexis died some years after. 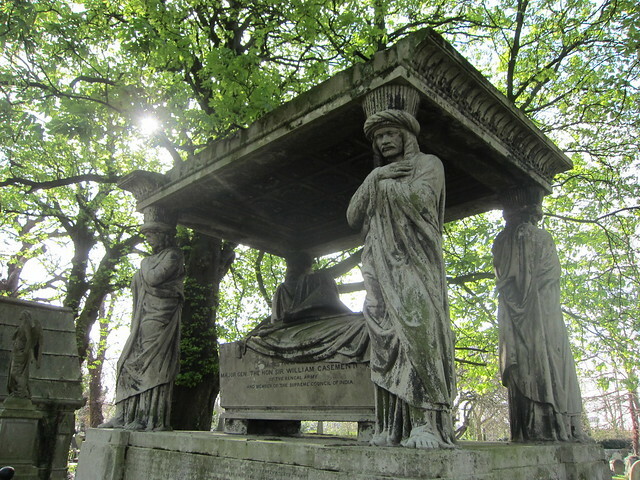 The elaborate grave of Gen. Sir William Casement includes a Greco-Egyptian stone canopy supported by four giant figures. Beneath is sarcophagus draped in mourning.The highly decorated British Army Major General was a member of the Supreme Council of India. The artist William Mulready is memorialized with a statue of him in repose, miniatures of his paintings etched in the base. 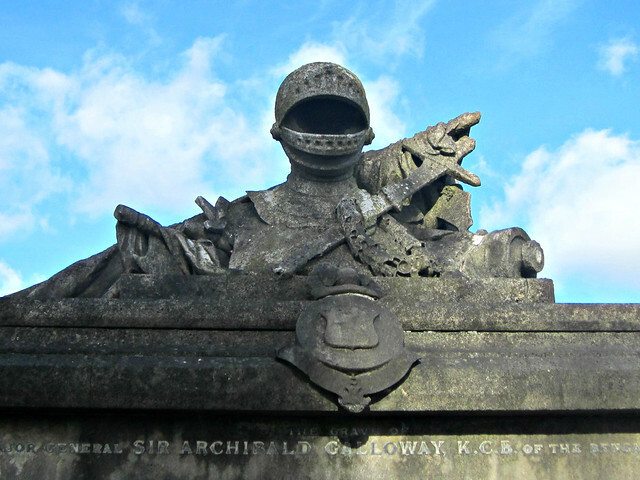 General Sir Archibald Galloway KCB of the Bengal Army has both his knighted status and military acclaim eternally on view atop his grave. 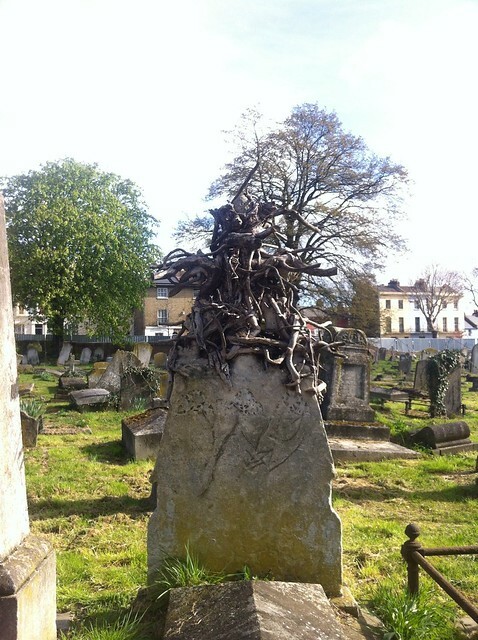 Here is my nominee for creepiest grave of Kensal Cemetery, where it seems that a long gone tree that once wrapped its branches on this tombstone’s cross still is in an eternal embrace, the dry limbs coiled on the cold stone. Also unsettling was this area of columns that seemed to be attached to a building that served as a hostel. Hopefully a very cheap hostel. 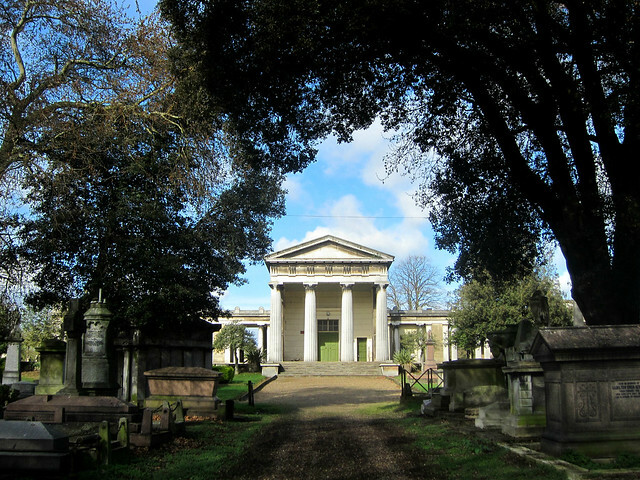 I read that there are tours offered by the Friends of Kensal Green Cemetery that include the catacombs, which I unfortunately could not make on this trip, but would absolutely love to do sometime. I felt like I got a bit lucky in seeing some of the more interesting graves, but I feel like there is much more beneath the surface. I mean, there literally is more under its physical surface, but I really would prefer not to see too much of that, unless I can ride the catafalque.